Back in March, the Motion Picture Association of America re-launched its film-rating website, filmratings.com. While this may be old news to some, I just learned about it from a post on BoingBoing which makes fun of the rationales given for the ratings, which are available on the new website. Example: The movie "3 Ninjas Knuckle Up" was "rated PG-13 for non-stop ninja action." Continue reading MPAA Ratings Are Better Than the Alternative . . .
Wall Street Journal columnist Holman Jenkins has a terrific, wide-ranging interview with Google CEO Eric Schmidt in today's paper that is well worth reading. One thing worth highlighting is Schmidt's comments on the "economic disaster that is the American newspaper." He argues that, "The only way the problem [of insufficient revenue for news gathering] is going to be solved is by increasing monetization, and the only way I know of to increase monetization is through targeted ads." The reason for the indispensability of advertising is simple: Information (including news and other forms of "content") has "public good" characteristics that make it is very difficult (and occasionally impossible) for information-publishers to recoup their investments. Simply put, they quite literally lack pricing power: Whatever they charge, someone else will charge less for a close substitute, inevitably leading to "free" distribution of the content, even though the content is anything but free to produce. Advertising is the one business model that has traditionally saved the day by rewarding publishers for attracting the attention of an audience. Thus an attack on advertising is an attack on media / news itself. And yet Washington is currently engaged in an all-out assault on advertising, marketing, and data collection efforts / business models. Incidentally, Google recently submitted comments with the Federal Trade Commission in reaction to its Staff Discussion Draft about the future of journalism and laid out their views on many of these issues. More importantly, as summarized on pg. 30 (of the pdf) of this Newspaper Association of America filing to the FTC, Google has proposed an interesting monetization model that utilizes Google Search, Google Checkout and DoubleClick ad server, "to build a premium content system for newspapers." Worth checking out. Kudos to Google for taking these steps and to Schmidt for again stressing the importance of targeted advertising for the future of media. Interesting article in the New York Times today about how the radical media activist group Free Press is now working with an organization called The Harmony Institute toward the goal of "Adding Punch to Influence Public Opinion." The way they want to "add punch" is through entertainment propaganda. The Times article notes that Harmony's mission is "aimed at getting filmmakers and others to use the insights and techniques of behavioral psychology in delivering social and political messages through their work." And now they want to use such "behavioral psychology" and "political messaging" (read: propaganda) techniques in pursuit of Net neutrality regulation. More on that agenda in a second. First, I just have to note the irony of Harmony's founder John S. Johnson citing "The Day After Tomorrow" as a model for the sort of thing he wants to accomplish. According to the Times interview with him, he says the movie's "global warming message [and] rip-roaring story, appeared to alter attitudes among young and undereducated audiences who would never see a preachy documentary." I love this because "The Day After Tomorrow" was such a shameless piece of globe warming doomsday propaganda that it must have even made the people at Greenpeace blush in embarrassment. After all, here is a movie that claims global warming will result in an instantaneous global freeze (how's that work again?) and leave kids scurrying for the safety of New York City libraries until a quick thaw comes a couple of weeks later. (Seriously, have you seen that movie? That's the plot!) So apparently we can expect some pretty sensational, fear-mongering info-tainment from Harmony and Free Press. But here's what's better: Do you know who produced "The Day After Tomorrow"? Oh, that's right... Rupert Murdoch's News Corporation financed and distributed that movie!! The man that Free Press casts as the nefarious media overlord set to take over all media and program our brains gave us the greatest piece of radical environmental propaganda of modern times. Now, which does that prove: (A) Rupert Murdoch is hell-bent on programming our minds to embrace a sweeping global warming regulatory agenda, or (B) Rupert Murdoch is out to entertain people and make money? If you answered B, congratulations for being a sensible person. If you answered A, then click here now to start giving money to the Free Press! OK, so let's get back to Free Press and what they are up to with the Harmony Institute (which I originally thought was an online dating site). Free Press apparently hired Harmony to research public attitudes about Net neutrality and how to influence them. Harmony's Johnson tells the Times they got interested in the Net neutrality because Free Press and the Pacific Foundation paid them handsomely to do so. And it appears Free Press got their money's worth. Continue reading Harmony Institute & Free Press Seek to Create Net Neutrality Propaganda . . .
Over at MediaFreedom.org, a new site devoted to fighting the fanaticism of radical anti-media freedom groups like Free Press and other "media reformistas," I've started rolling out a 5-part series of essays about "The Battle for Media Freedom." In Part 1 of the series, I defined what real media freedom is all about, and in Part 2 I discussed the rising "cyber-collectivist" threat to media freedom. In my latest installment, I offer an analytical framework that better explains the major differences between the antagonists in the battle over media freedom. In his many enlightening books, Thomas Sowell, a great economist and an even better political scientist, often warns of the triumph of good intentions over good economics. It's a theme that F.A. Hayek and Milton Friedman both developed extensively before him. But Sowell has taken this analysis to an entirely differently level in books like A Conflict of Visions: Ideological Origins of Political Struggles, and The Vision of the Anointed: Self-Congratulation as a Basis for Social Policy. Sowell teaches us that no matter how noble one's intentions might be, it does not mean that those ideas will translate into sound public policy. Nonetheless, since "the anointed" believe their own intentions are pure and their methods are sound, they see nothing wrong with substituting their will for the will of millions of individuals interacting spontaneously and voluntarily in the marketplace. The result is an expansion of the scope of public decision-making and a contraction of the scope of private, voluntary action. As a result, mandates replace markets, and freedom gives way central planning. Social and economic order develops in bottom-up, spontaneous fashion. Top down planning is hard because planners aren't omnipotent. Order derives from smart planning, often from top-down. Elites can be trusted to make smart social & economic interventions. Prudence and patience are virtues. There are limits to human reason. Passion for, and pursuit of, high ideals trumps all. Human reason has boundless potential. Law evolves and is based on the experience of ages. Law is made by trusted elites. Continue reading The Battle for Media Freedom: A Conflict of Cyber-Visions . . .
Is a Massive Taxpayer-Funded Propaganda Machine Really a Good Idea? 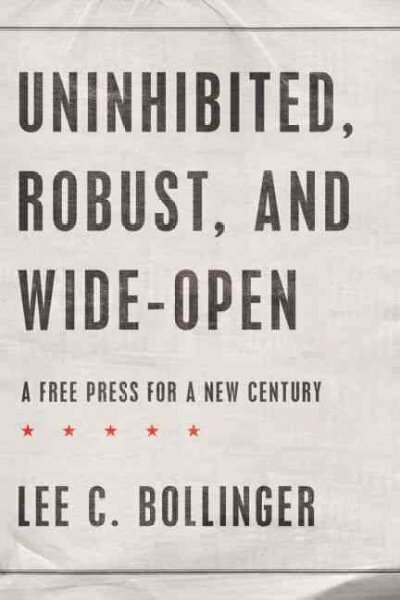 Earlier this year, while I was preparing this mega-filing to the Federal Communications Commission in its "Future of Media" proceeding, I read Uninhibited, Robust, and Wide-open: A Free Press for a New Century, by Lee C. Bollinger, who is the president of Columbia University. I had planned on reviewing it since I try to review almost every book I read, but it was hard for me to believe that anyone would take this book too seriously, so I just moved along. To me a key priority is to strengthen our public broadcasting role in the global arena. In today's rapidly globalizing and interconnected world, other countries are developing a strong media presence. In addition to the BBC, there is China's CCTV and Xinhua news, as well as Qatar's Al Jazeera. The U.S. government's international broadcasters, like Voice of America and Radio Free Europe, were developed during the Cold War as tools of our anticommunist foreign policy. In a sign of how anachronistic our system is in a digital age, these broadcasters are legally forbidden from airing within the U.S. This system needs to be revised and its resources consolidated and augmented with those of NPR and PBS to create an American World Service that can compete with the BBC and other global broadcasters. China's CCTV and Xinhua news? Qatar's Al Jazeera? Really?! As Jeff Jarvis rightly asks in his terrific response essay, "No American BBC,": "In what sane world is the Chinese government's relationship with news a model?" Indeed, this is frightening stuff. Has Bollinger not studied the Chinese system of state media meddling? Needless to say, it's not pretty. And while I would agree that the BBC model shows that some State-funded media can be quite impressive and free of most meddling, that's not been the case across the board. Continue reading Is a Massive Taxpayer-Funded Propaganda Machine Really a Good Idea? . . . I've been so busy trying to cover breaking developments related to Washington's new efforts to "save journalism" (FTC) and steer the "future of media" (FCC) -- see all my recent essays & papers here -- that I forgot to do a formal book review of the book that is partially responsible for whipping policymakers into a lather about this issue: The Death and Life of American Journalism, the media-takeover manifesto by the neo-Marxist media scholar Robert W. McChesney and Nation editor John Nichols. Their book is horrifying in its imperial ambitions since it invites the government become the High Lord and Protector of the Fourth Estate. [For an in-depth look at all of McChesney's disturbing views on these issues, see: "Free Press, Robert McChesney & the "Struggle" for Media."] Anyway, I put together a formal review of the book for City Journal. It's online here and I've also pasted it down below. Imagine a world of "post-corporate" newsrooms, where the state serves as the primary benefactor of the Fourth Estate. Billions flow from bureaucracies to media entities and individual journalists in the name of sustaining a "free press." And this new media welfare state is funded by steep taxes on our mobile phones, broadband connections, and digital gadgets. Sound Orwellian? Well, it's the blueprint for a press takeover drawn up by Robert W. McChesney and John Nichols in their new book, The Death and Life of American Journalism. McChesney, the prolific neo-Marxist media scholar who teaches at the University of Illinois at Urbana-Champaign, and Nichols, a journalist with The Nation, aren't shy about their intentions. Along with Free Press, the absurdly misnamed regulatory activist group they co-founded, McChesney and Nichols outline a self-described "radical" agenda for what they hope will become a media "revolution." And, shockingly, some folks in the Obama administration are listening. 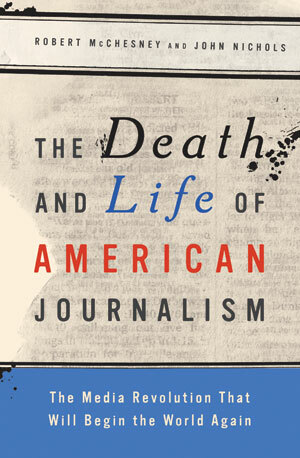 Continue reading Book Review: The Death and Life of American Journalism . . .
For the past twenty years, my life and work in Washington D.C. have let me both observe and contribute to the operation of what is surely one of the best governments in human history. The resulting perspective was sometimes inspiring, often perplexing, and sometimes depressing. But while the daily foibles of representative democracy may sometimes cause even its most ardent advocates to contemplate the restoration of the Bourbon Monarchy, there are also those faith-restoring moments when principle unexpectedly trumps politics and common sense suddently prevails. That happened this morning at a hearing held by the Senate Committee on the Judiciary entitled Oversight of the Office of the Intellectual Property Coordinator. Unless I am mistaken, this hearing produced something that I would not yet have predicted: a politically risky, bipartisan, Legislative/Executive-Branch call for private copyright owners, internet-access-service providers and payment processors to work together to devise private solutions to the challenges of curbing digital piracy and internet counterfeiting. Continue reading Wow: A Bipartisan, Legislative/Executive Call for Private Solutions to the Challenges of Internet Counterfeiting and Piracy . . .
event reminder: May 20th - "Can Government Help Save the Press?" event: May 20th - "Can Government Help Save the Press?" event reminder: "Cable, Broadcast & the First Amendment: Will the Supreme Court End Must-Carry?" Who Said Micropayments Can't Work? PFF TechCast #1: Proposals to Have Government "Save Media"
Steve Forbes on Free Press & Coming "Chavez-Style Media Crackdown"
What is a "Trust Fund for Public Media" Doing in the FCC Broadband Plan? Would a "Citizenship News Voucher" Get Us More "Broccoli Journalism"? testimony at FCC's Hearing on "Serving the Public Interest in the Digital Era"
When Will Free Press Actually Begin to Advocate for Freedom of the Press? Event: "The Crisis in Journalism - What Should the Government Do?" Did Air America Die Because America is Turning to the Right? Good Bye to Senator Dorgan and, I Hope, to the "Tale of the Minot Train Wreck"
And so the Comcast-NBC Merger Hysteria Begins: Help Me Document It! Extra! Extra! Read all about it! The Post Closes All of its National News Bureaus! Is There Really Any Shortage of Good Programming Options for Kids? What's next from PTC, a call for banning books? Where Will Local News Come From? "I Hate to Introduce Reality into an FCC Proceeding"
A Fairness Doctrine for the FCC Blog? What Unites Advocates of Speech Controls & Privacy Regulation? Shall We Save Media by Socializing It? Don't Worry about the Fairness Doctrine. No, Wait, Strike That. Will Traditional OTA Broadcast Networks Go Cable-Exclusive? Do Irish-Americans Deserve a Satellite Radio Set-Aside? Tim Wu on Obama, McCain, and "a Chicken in Every Pot"
"'Local' is just one set of ripples on the lake of information"
Our Continued Wishful Thinking about "Media Localism"
Comcast to move to bandwidth cap / metering solution? "Critical blow" for broadcasters in the ad market? Jon Fine's "Requiem for Old-Time Radio"
Does "the public" really communicate with the FCC? A Rushed Review for XM-Sirius? Who Killed TV's "Family Hour"? new City Journal essay on "The Media Cornucopia"
Declaration of Independence for Virtual Worlds? Appearance on C-SPAN's "The Communicators"
Media Deconsolidation, Part 15: AOL-TW Divorce Near? The Final Fantasy Leak: Situational Ethics with Video Game Piracy? Media Deconsolidation, Part 14: Time Warner Without Time? Wanna Be Mayor of New York? The Economics of Trade Shows & the Downsizing of "E3"
A Psychological Explanation for Censorship and Claims of "Media Bias"
Media Deconsolidation, Part 12: Time Warner President Calls Synergy "Bull---t"
Net Neutrality = A Financial Services Industry Free-Ride? So You Still Believe in Infrastructure Socialism? Is Convergence Nothing But Hype? Google, Do You Really Want to Be a Telecom Company? Long Live Public Interest Regulation! What Does the Future Hold for the Television Industry? My TCS Article on "What Ever Happened to the Big Media Boogeyman?" Supreme Court Rejects Media Ownership Case--What's Next? Media Myths Book is Finally Out! Ben Compaine on Media's "New Western Frontier"
Have a Contractual Dispute? Run to the FCC! new Ben Compaine / NMRC report on "The Media Monopoly Myth"
Media Deconsolidation, Part 5: "Clear Channel to Dismantle Media Empire"
Media Convergence and the "Digital Zoo"
Media Deconsolidation, Part 4: Is News Corp. Next to Downsize? Stop This Insane Media De-Consolidation! - Is a Massive Taxpayer-Funded Propaganda Machine Really a Good Idea?